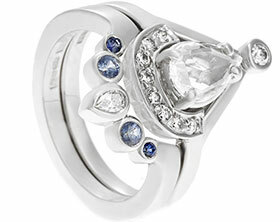 Jane had a pear cut sapphire engagement ring which she had found many years previously in our designer collection. 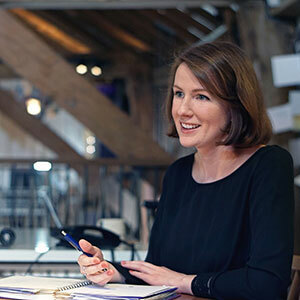 When she got married her and her partner Bryan chose plain platinum wedding rings from a shop in the USA but Jane’s wedding ring didn’t fit into the beautiful shape of her engagement ring and she was never happy about it. An upcoming anniversary gave Jane the idea of re-designing her wedding ring.We were able to re-use the platinum of her original wedding ring to make a ring which fitted her engagement ring properly.We choose to add some graduating blue to white stones to her new ring to make it even more special. The result was fantastic and the colour of her new stones go so well with the lovely pear cut sapphire she already has in her engagement ring. 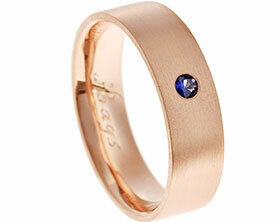 An unique wedding ring to suit a striking enagagement ring. Bespoke pair of wedding rings with engraved lettering. 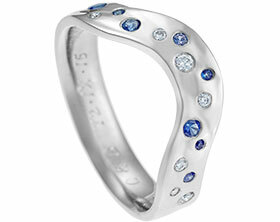 Fitted platinum wedding ring with two 1.5mm brilliant cut blue sapphires. Fitted Silver engagment and wedding ring with a blue Sapphire. Bespoke 9ct white gold engagment and wedding ring set. 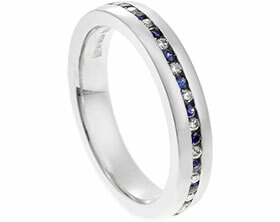 Platinum fitted wedding band with sapphires and diamonds. 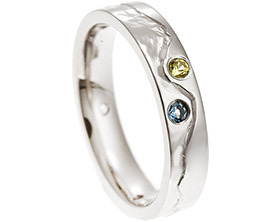 Bespoke 9ct white gold wedding ring with graduated coloured sapphires. 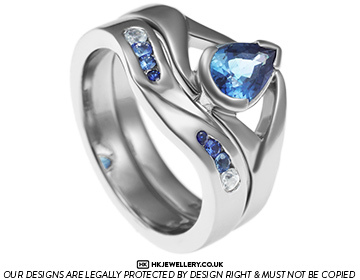 Bespoke 9ct white gold shaped ladies wedding band with invisibly setpale blue sapphire. 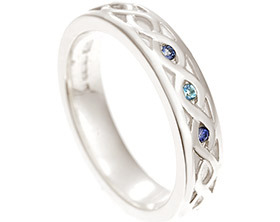 9ct white gold wedding band with a 1.5mm grain set blue sapphire set on the inside. 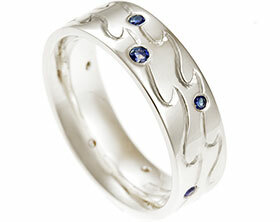 9ct white gold wedding ring with 2 sapphires and hand engraved lines. Platinum shaped wedding ring with a blue sapphire. 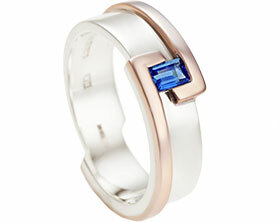 A 9ct white gold wedding ring set with a single Ceylon sapphire. 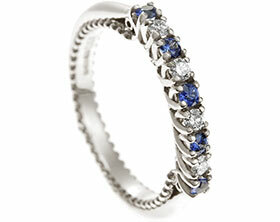 A platinum wedding ring set with Ceylon sapphires.